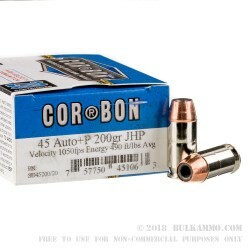 World renown for producing some of the hottest ammo on earth, Corbon’s .45 ACP +P ammunition delivers a 200-grain jacketed hollow point projectile at a muzzle velocity of 1050 FPS. This faster velocity causes deep penetration after tearing through denim and other clothing before expanding rapidly, making these a one-stop shot in self-defense. Ballistic gel tests rated these .45s with a 8 to 15 inches of penetration, with expansion after impact being as large as twice the original bullet diameter. The hollow points themselves feature a gilding metal jacket over a soft lead core, while the jacket is scored to provide immediate expansion. 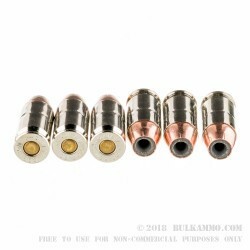 These rounds are loaded into noncorrosive, nickel plated boxer-primed reloadable brass cases and are meant to be used in firearms rated for the higher pressures of +P. 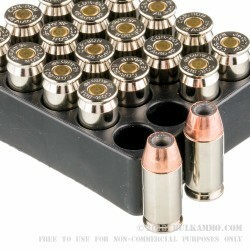 This bulk package of .45 ACP ammunition from Corbon contains twenty-five, 20 round boxes of +P ammunition. American-made Corbon, began making their original hollow points in 1982 and has continued to provide highly effective self-defense rounds for more than 30 years. Made in Sturgis, South Dakota, Corbon designs and produces reliable consistent ammunition for self-defense, hunting and match shooting.